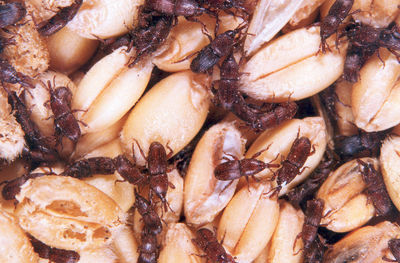 Weevils are those nasty little creatures that invade our kitchens and destroy our pantries. They will find their way into our flour, rice, pasta, crackers, cake mixes – in fact, anything that contains grains. Sometimes we’ll even unknowingly bring them into our homes from the store. These tricky little pests are not always easy to detect but there are measures we can take to rid our home of them and lower our risk of them returning. -	Start by checking products when purchasing them. 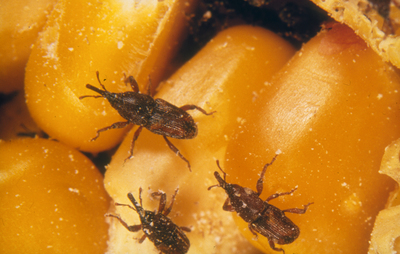 Look at use-by dates and check packaging for holes – even tiny ones – those weevils are pretty sneaky. -	Make sure your cupboards are clean and free of crumbs or other spills. It is said that cloves or bay leaves in your cupboard will deter weevils but I have not personally tested this theory. -	Always seal packaging up tight after use or store in air-tight containers. I fold the top of bags down several times and secure with a bulldog clip or rubber band. -	Weevils don’t like the cold, so consider storing your products in the fridge or freezer but make sure they’re well sealed to deter moisture. -	Weevils also don’t like heat. You can either spread your products out on an oven tray on a low heat or zap them in the microwave to kill off any weevils or their eggs. -	You might like to try emptying your cupboards and wiping out with a pyrethrum-based repellent. Ensure that it is completely dry and aired out before restocking. In conclusion, if you’ve tried everything and are still experiencing problems with weevils the best tactic is to only buy your products in small amounts so that they do not sit in your cupboard for too long.